Tuna steaks are definitely at their best when seared on a hot barbecue. 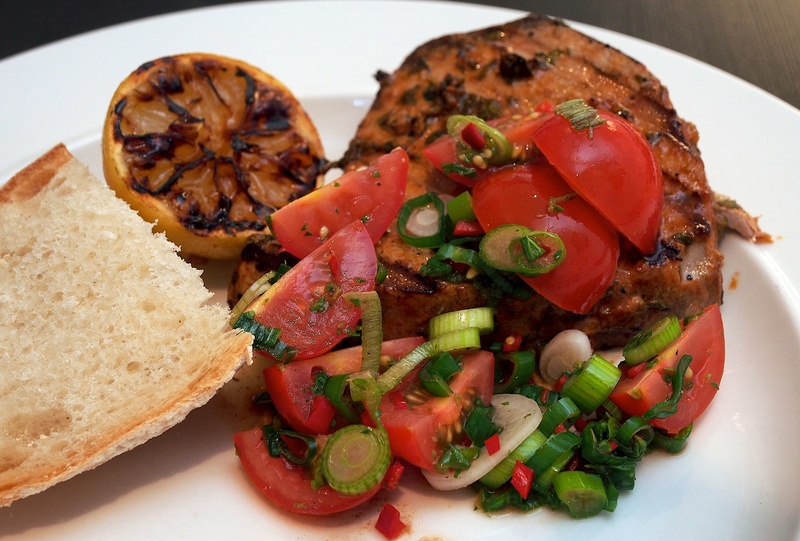 The marinade would also work well with other firm fish fillets such as swordfish or kingfish. Wine suggestion: we think a light bodied red would be a treat here which goes against traditional pairings. The trick is to get a lighter body and lower tannins. We drank a Beaujolais-Villages from Domaine Rochette, a delightful wine which balances it’s lightness with an obvious care from the winemaker and good fruit from the vineyards; polished and elegant as well as joyfully youthful. Put the fish in a shallow non-metallic dish. Mix together the lemon juice, olive oil, garlic, oregano and paprika. Pour this over the fish, cover with cling-film and refrigerate for half an hour. Preheat the barbecue to high and brush lightly with olive oil. Barbecue the fish for a couple of minutes on each side (longer if you prefer the fish well done). Toss all of the ingredients for the cherry tomato salsa together and season well with sea salt and freshly ground black pepper. Serve the fish with some salsa over the top and a lemon wedge. These little stuffed quail’s eggs are very cute but also very time consuming. It also helps if you have little fingers! 2 tsp salted capers, soaked in water for 10 minutes, drained and finely chopped, plus 24 extra to garnish. Put the eggs in a small pot of water, bring to the boil and cook for 2 minutes. Drain the eggs and put into a bowl of cold water to cool down before peeling. (The eggs are fiddly to peel but it’s a bit easier if you peel them while they are still in the water). Cut the eggs in half lengthways. Carefully remove the yolks and arrange the egg whites on a serving plate. Put the yolks in a bowl with the tuna, capers and 1 tbsp of mayonnaise then mix together. Season with a little salt and some pepper. Use your hands to roll the mixture into little balls, about 1tsp at a time. Carefully put the little balls into the cavities of the half eggs. 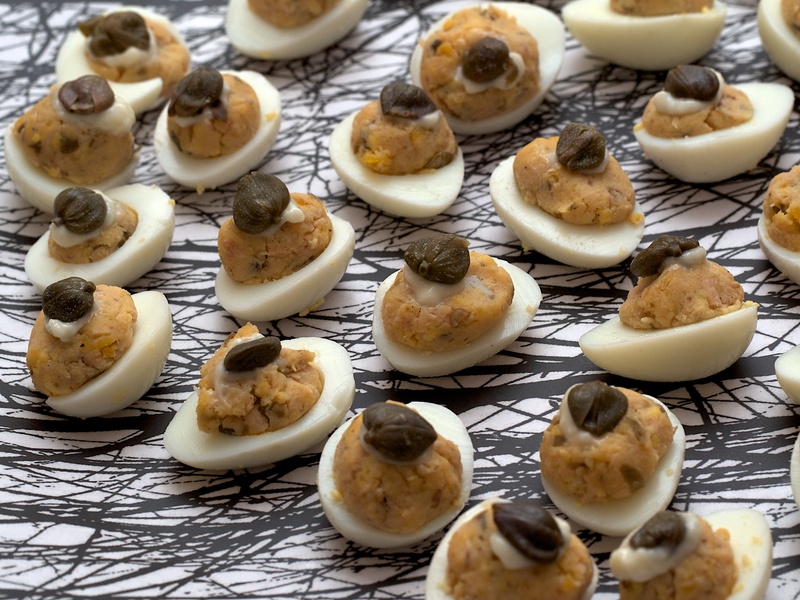 Spoon a tiny bit of mayonnaise on top of each half egg and garnish with a whole caper. 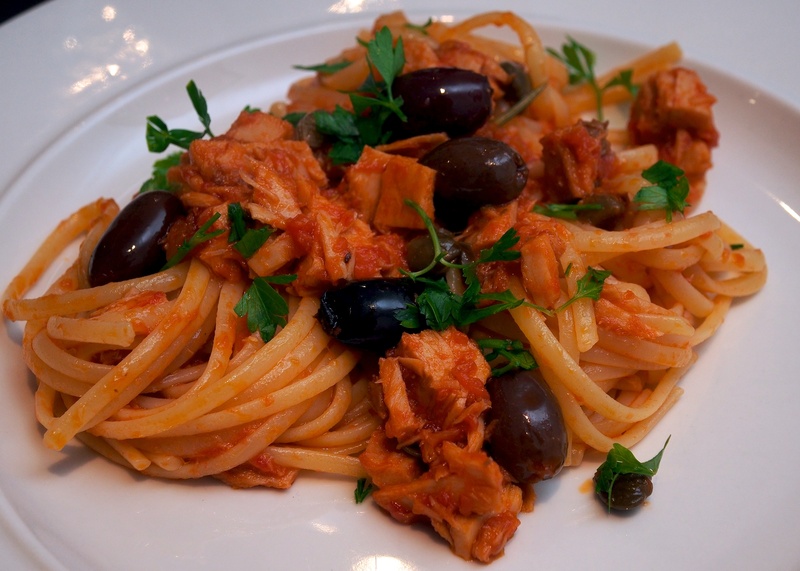 You could drizzle a bit of olive oil and add a twist of black pepper to finish. Wine Suggestion: These are the kind of thing you can set out for people to nibble at when they’re having an aperitif. A good DOCG Prosecco would be nice. Tataki is a Japanese way of preparing fish which involves searing it quickly, slicing thinly and serving with ginger that has been pounded into a paste. This takes just 15 minutes to make and is fresh, tasty and healthy. Rub the tuna with the black pepper and sear in a hot non-stick pan for 1 minute on either side. Rest for a couple of minutes before slicing into strips. 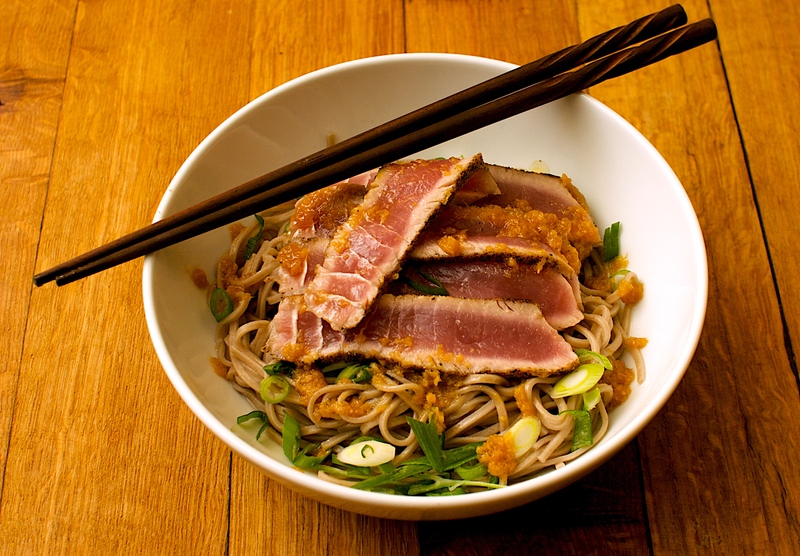 Divide the noodles between 2 bowls and add half the tuna strips to each. Top with the scallions. Mix the rest of the ingredients together to form a paste and drizzle this over the tuna and noodles. Wine Suggestion: Tuna is meaty fish but this dish is definitely not heavy so a light red wine, such as a Beaujolais would work well. Stick it into the fridge for a short time so it is slightly chilled and it will give the whole meal a zing.